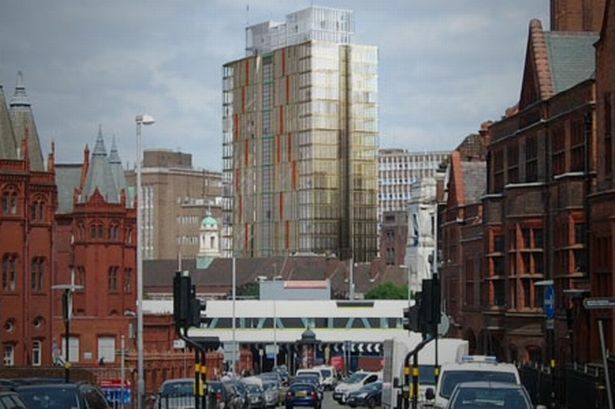 The third set of plans for modern glass 23-storey skyscraper rising above Birmingham’s historic Central Fire Station have been overwhelmingly rejected by city councillors. Developer Watkins Jones has twice redrawn for the rectangular student accommodation block, dubbed &apos;the tombstone&apos;, and cut the height by six storeys following earlier criticism - but has still failed to convince leading architectural and conservation bodies to support it. Planning committee member Barry Henley (Lab, Brandwood) said that the principal of placing this giant block in the middle of this landmark listed building was wrong and tinkering with the design would not help. Speaking after the meeting, he said: "You can’t polish a t**d."
He added: "The idea is bad, it cannot be improved upon." And he criticised the developer and planning officials who backed the scheme for ignoring the views of English Heritage, the Victorian Society, the 20th Century Society, the council’s own Conservation Panel and the architecture watchdog CABE, who all viewed the design as unsuitable. His colleague John Clancy (Lab, Quinton), who had previously called for the tombstone to be replaced with a Toblerone to fit the fire station’s triangular design said he was disappointed they had not listened. "It’s more a Yorkie Bar than a Toblerone," he said. But the scheme was defended by planning committee chairman Peter Douglas Osborn (Cons, Weoley) who said that it was the only financially viable means of restoring the Fire Station, which has been empty for more than five years. "We have to save this building." The inference was that without a the tower block the fire station is too expensive to restore, without a subsidy or Heritage Lottery Grant. Paul Rouse, of planning agent Savills, speaking on behalf of the developer said: "The re-use of the fire station without altering the fabric of the building is only viable with this tower." He also challenged a claim from Aston University that there is no demand for the 823 student bedsits, by pointing out that Birmingham City University will be welcoming 11,000 students to the area by 2015. The committee voted by ten to two against the plan.